Unbelievable Book Sewing. 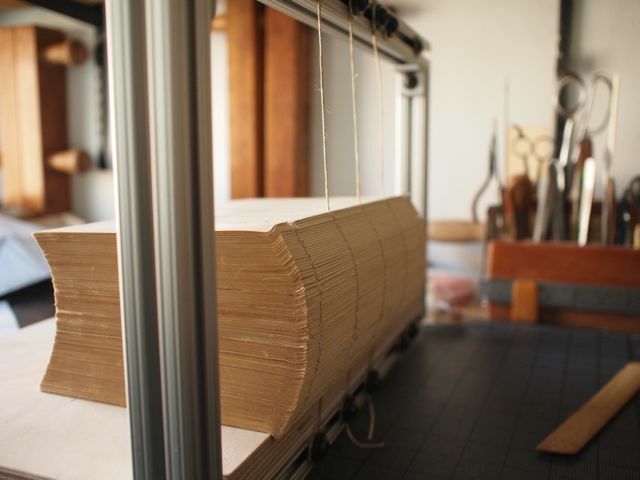 The American Bookbinders Museum. Petition Against the Closure of the Greek Conservation Department. Chase, A. and Clow, Stories of Industry, Vol. II. (Educational Publishing Co.: Boston, New York, Chicago, 1891), 174. Author’s collection. I can’t quite believe the above image reflects an actual practice. Sliding the books up after they are sewn? This would seem to cause extreme abrasion to the cords, thread and signatures. Cords from this time are often very weak, though. There are other suspect elements; the title is wrong and the sewing frame uprights are incredibly tall. The whole frame would likely be very unstable and the tension on the cords would be extreme; could three weak, thin, late nineteenth century cords support this weight? Generally this image is believable, though. The body and hand positions of the women are accurate. Women from around this time could sew very fast, 2-3 thousand signatures a day. 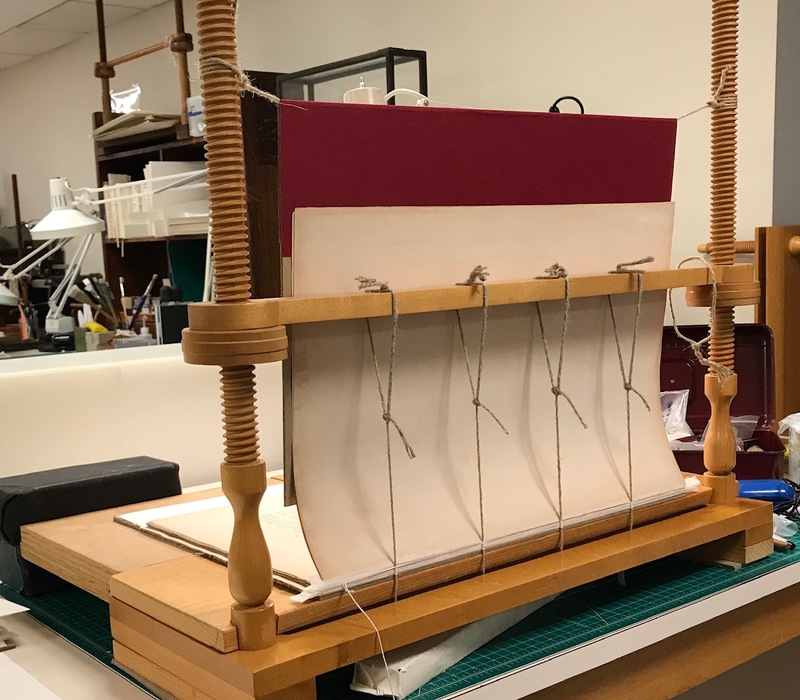 Being able to sew a large number of books without having to restring the frame would likely be a time savings. Is this image the result of artistic imagination, ignorance or possibly an accurate description of an unusual trade practice? 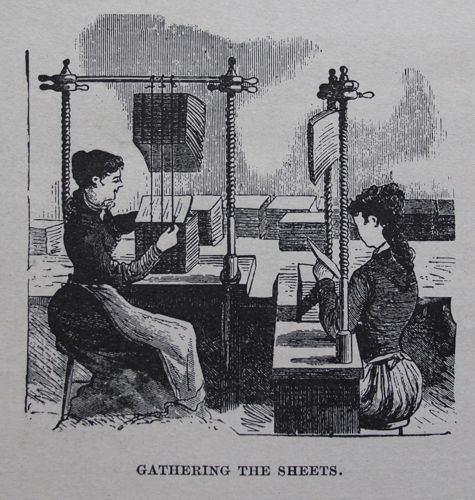 Whatever the case, I wouldn’t have found this intriguing image if it were not for the wonderful online bibliography of bookbinding manuals from The American Bookbinders Museum. It is annotated, so can save anyone a lot of time searching through less useful sources. 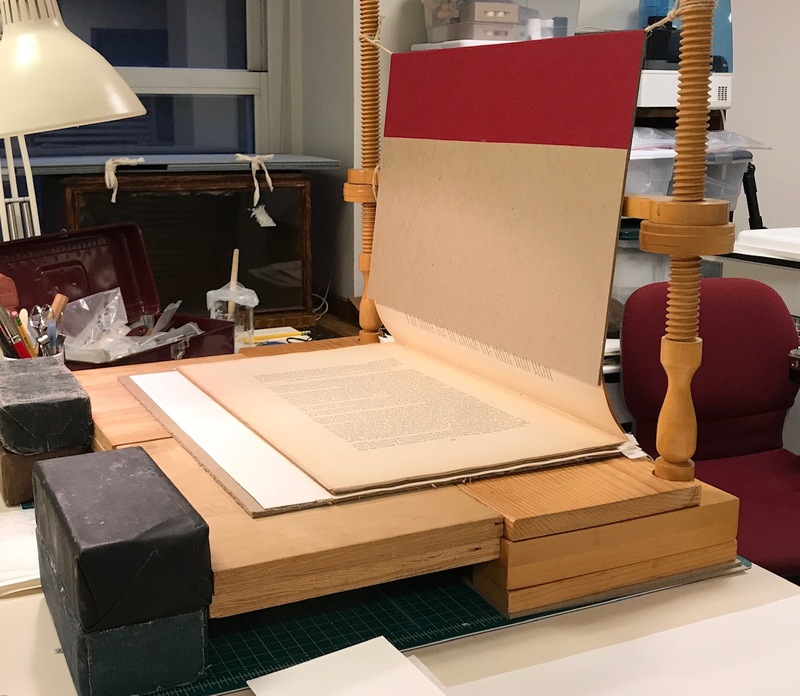 The American Bookbinders Museum was also incredibly gracious host when I taught my 18th century French class in San Francisco, letting us closely examine a first edition of Dudin’s 1772 L’Art du Reliure, followed by a reception. Their collection of books, tools and machines is unique and irreplaaceable. But The American Bookbinders Museum is currently in crisis, due to two water leaks in recent months. They need to raise a lot of money to relocate their collection. I chipped in. 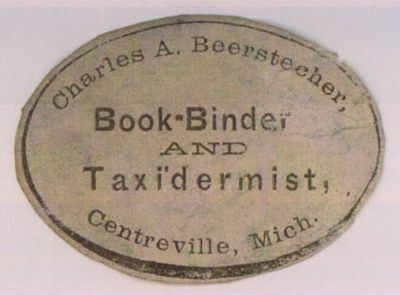 How could you not contribute to a Museum that contains possibly the coolest bookbinders ticket ever? The Museum is a 501-(c)3 organization and all donations will be tax deductible. And since you are doing one good deed, how about signing this petition to help save the Greek Conservation Department as well? The Department for the Protection and Conservation of Cultural Heritage in Zakynthos, Greece of the Technological Educational Institute of the Ionian Islands is threatened with unjust and unreasoned closure by the Greek Ministry of Education. 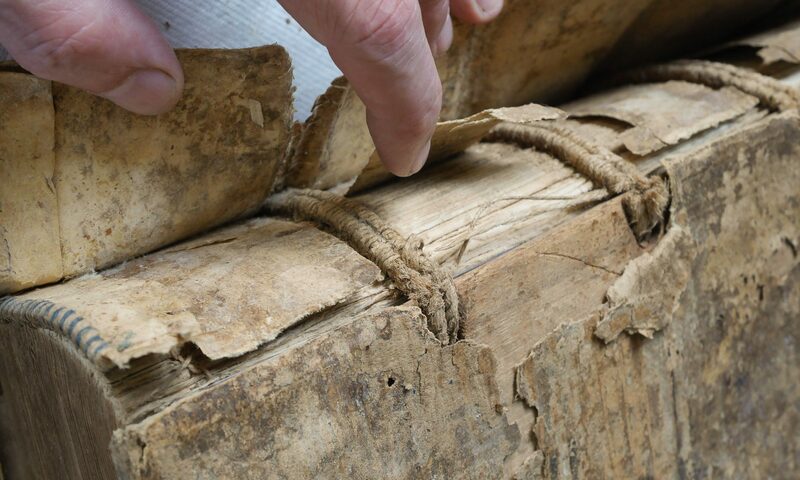 The profession of conservation is suffering a blow yet again, following the closure of several courses throughout Europe over the last few years and job cuts in museums, libraries and institutions, putting our cultural heritage at greater risk. Please read our petition and if you support our cause sign it and forward it anywhere you can.